Very few in mainland India are aware at the moment that a process of citizens’ registration on the basis of racial profiling is under way on the eastern fringe of the country. The national media — both print and electronic — has not cared even to report the ongoing preparation of the National Register of Citizens (NRC), leave alone analysing the legal nuances involved in the action and the possible plight of the ‘denizens’. This exercise, initiated through a gazette notification dated December 5, 2013 by the Registrar General of India, was initially due to be completed within a time span of three years. But the judgment delivered by a Division Bench of the honourable Supreme Court (Coram JJ, R. Gogoi, R.F. Nariman), dated 17 December 2014, advanced the due date of publication of the final NRC to January 1, 2016. The whole exercise, set off in a selective manner only for the State of Assam, is meant for detection, detention and deportation of the illegal migrants who crossed over to Assam from Bangladesh on or after March 25, 1971. The vexed issue of infiltration and expulsion of foreigners in Assam, which has dominated the political theatre of the State for over three decades, has got close links with the very history of the subcontinent. Colonial history of the State dates back to 1826 when, under the Treaty of Yandabo, the then geography of what is now called Assam came under the British rule. And the tract was made a part of the Bengal Presidency which, of course, included the erstwhile East Bengal as well. In a different turn of events, Cachar, now one of the three districts forming the Barak Valley in southern Assam, was annexed by the Britishers after the fall of the Kachari Kingdom in 1832, and was also made a part of the huge Bengal Presidency. Such arrangements were made much before the first Government of India Act, 1858 through which control over the Indian territories held by the British East India Company was vested in the British queen. They effectively meant that people of Bengal and of Assam — transcending ethnicity, language and culture — lived within the same administrative jurisdiction and under the same political dispensation. In 1874, by a whimsical decision of the British government, two districts of East Bengal — Sylhet (along with Cachar) and Goalpara — were separated from the Bengal Presidency, and were joined with Assam to create a new administrative unit which was placed under a Chief Commissioner. This was technically the first Partition of Bengal, a development that unfortunately escaped the attention of the mainstream scholarship. Much has been written and read about the partition of Bengal in 1905, and its eventual rollback in 1911. However, surprisingly enough, historians of modern India have shown cruel indifference to the cultural knifing of 1874, due to which the Bengalis of Sylhet and Goalpara of the then East Bengal, for no fault of theirs, had to shift their allegiance to a completely different cultural geography. The colonial power had its own fiscal logic. Sylhet, a revenue-rich district in British India, was tagged with a revenue-deficit Assam to address the administrative purpose of fiscal rationalisation. These two districts thereafter continued to exist inside the administrative boundary of Assam for the remaining length of the colonial rule. In 1947, Sylhet was lost to Pakistan on the basis of the outcome of an allegedly rigged referendum. The communal carnage that took over the subcontinent resulted in the biggest displacement of people in the recorded history. The humanitarian crisis had its ramifications both on the eastern and the western boundaries of the newly liberated India. But in terms of number, intensity and continuity, impact of the exodus felt on the eastern front far exceeded that on the west. The internal political turmoil, coupled with communal riots first in East Pakistan, and then in Bangladesh, made sure movements across the boundary remained a regular feature even after 1971. This repeated redrawing of political map of Assam, along with that of the twin valleys of Surma and Barak by the colonial rulers, showing utter disregard to the sentiments of the Assamese and the Bengalis, is causally connected to the emergence of the parochial political patriarchs who assumed power in the Assam in the post-Independence India. Assamese middle-class saw in the British actions of administering Bengali settlement on their own land an evil design of linguistic hegemony. Hence, in the post-colonial Assam, they tried to correct history. In a bid to retaliate, the Assamese elites, who by then had got a fair share of political power, began to treat Bengali settlers on Assam’s soil as ‘cultural foreigners’. The genesis of the anti-foreigner movement, spearheaded by the All Assam Students’ Union (AASU) during 1979-85, thus, dates back to the series of above happenings where politics played mayhem with culture. There was no evidence provided by either the government or the academia about the scale of cross-border movement of people. Despite that, the xenophobic movement launched by the AASU during the early 1980s was successful in convincing the Indian establishment that a ‘marauding infiltration’ by Bangladeshi nationals from across the border was putting the Assamese language and culture in great danger. The six-year-long violent agitation, which left hundreds dead and thousands traumatised, culminated in the inking of the Assam Accord on August 14-15, 1985. This tripartite memorandum of settlement between the Centre, the Assam government and the AASU leadership was considered ‘historic’ in the Brahmaputra Valley. The Citizenship Act, 1955 was suitably amended by the Parliament to incorporate Section 6(a), bringing in a special provision of citizenship for Assam. The legislative passage engineered by the Rajiv Gandhi government, which had a brute majority in both the Houses, did not care for the history, geography and anthropology of colonial Assam. The Nellie pogrom of February 18, 1983, in which more than 2,000 Bengali-speaking people, including women and children, were butchered, was conveniently forgotten by the Indian state. That gory incident has never been given enough attention in the media. Successive governments have not been able to bring the killers to justice. To the contrary, the metamorphosis of AASU into Asom Gana Parishad and its eventual victory in Assembly elections has practically legitimised the racial killings. The Bengali speaking citizens in Assam now face a new kind of terror, this time, from the Indian government. On the strength of an agreement, the State government is now active in the preparation of the National Register of Citizens. This is aimed at labelling lakhs of Bengali-speaking citizens as ‘illegal Bangladeshi infiltrators’. The relevant rules and provisions in the statute book, including the Citizenship Act, 1955; the Foreigners Expulsion Act, 1946; the Immigrants (Expulsion from Assam) Act, 1950; the Foreigners Tribunals Order, 1964; and the Citizenship Rules, 2003 (as amended in 2009 and 2010), have all been very carefully crafted over the years to evict from Assam the Partition victims of erstwhile East Pakistan, now Bangladesh. The Indian government has decided to upgrade the NRC only for the State of Assam even though, ideally, the exercise should have covered the entire country. The purpose of this official action is not difficult to decipher. The stringent set of conditions attached to the process requires the Bengalis of Assam to prove their Indian citizenship solely on the basis of their or their ancestors’ names appearing on the electoral rolls published up to 25 March 1971 and the NRC of 1951, failing which they would be thrown out of the updated NRC. To make things complicated for these people, such electoral rolls are found to be both incorrect and incomplete. On the other hand, their Assamese and tribal counterparts would find easy inclusion, by virtue of being the ‘original inhabitants of Assam beyond reasonable doubt’. The key question that confronts us now is: what would happen to these hapless Bengali settlers? In the absence of any bilateral arrangement between India and Bangladesh, the latter is not ready to take them back. This implies that lakhs of such Indian citizens, who have had their names on the Indian electoral rolls for the past four decades, and who are in possession of Electoral Photo Identity Card, would be rendered stateless. 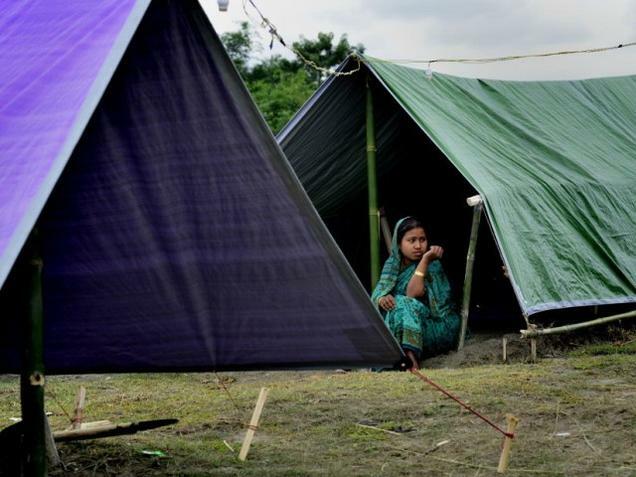 Going by the existing deportation norms and practices, they will just be evicted to the no man’s land on the Indo-Bangla border, that too in the dead of night. It will be a shameful moment for India, a proud signatory to the Universal Declaration of Human Rights. This entry was posted on September 13, 2015 at 3:43 pm and is filed under Advocacy, Article. You can follow any responses to this entry through the RSS 2.0 feed. Both comments and pings are currently closed.